Nonresistance is the term which in Anabaptist-Mennonite history has come to denote the faith and life of those who believe that the will of God requires the renunciation of warfare and other compulsive means for the furtherance of personal or social ends. The term itself is derived from the words of Jesus, "Do not resist one who is evil" (Matthew 5:39). The term pacifism is likewise derived from the words of Jesus, "Blessed are the peacemakers" (Matthew 5:9); hence true Christian pacifism may be thought of as synonymous with Christian nonresistance. Certain forms of pacifism or nonviolence, however, being based more upon humanitarian, philosophical, or political considerations than upon New Testament ethics, are not to be confused with nonresistance as here defined. Nonresistance was held by Anabaptists universally from the beginning, except for the revolutionary fringe in Münster and related elements (1534-40), and for the short-lived Hubmaier group in Moravia (1526-28). It was characteristic of all Mennonite groups in Europe until into the 19th century, and has been universally held by all American Mennonites until the present day. In Russia it was held by all groups until World War II. The doctrine of nonresistance has implications for every phase of the Christian's life, first of all in personal relations. The Christian brotherhood is a community of forgiven sinners whose attitude toward one another is that of unbounded forgiveness, unto "seventy times seven." Its members do not seek the highest position; they live in humble subjection one to another out of reverence for Christ who in washing the disciples' feet is their great example in humble, loving service. In the wider social relationships the emphasis is on doing justice, loving mercy, and walking humbly before one's God. Doing that which is just to others takes precedence over seeking justice for one's self or for one's group. Instead of going to law for the settlement of differences the Christian would rather suffer himself to be defrauded. In economic relationships the Christian community does not think in terms of buyer and seller or of management and labor, each seeking his own good; it thinks of itself as a brotherhood whose members are laborers together with God, in honor preferring one another. This way of love and nonresistance characterized the Anabaptists from the beginning. Walter Rauschenbusch says, "Their communities were prophetic.... They stood against war, against capital punishment, against slavery, and against coercion in matters of religion before others thought of it." Sixteenth-century Catholic opponents said they found among them "no lying, deception, swearing, strife, harsh language . . . , but . . . humility, patience, uprightness, meekness, honesty, temperance, and straightforwardness.... They call each other brethren and sisters.... they use no weapons of defense. . . . They do not go to law before judicial courts." 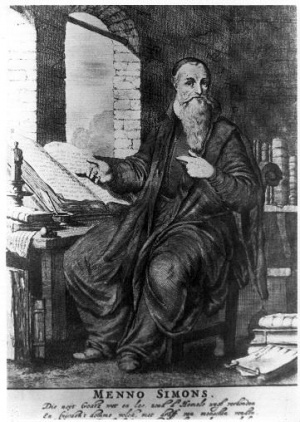 Menno Simons, by Jan Luyken (1681). From Menno Simons, Opera Omnia Theologica (Amsterdam, 1681). Source: Mennonite Church USA Historical Committee: The Portraits of Menno Simons. Menno Simons said: "The regenerated do not go to war, nor engage in strife. They are the children of peace who have beaten their swords into plowshares and their spears into pruninghooks, and know of no war.... Since we are to be conformed to the image of Christ, how can we then fight our enemies with the sword? . . . Spears and swords of iron we leave to those who, alas, consider human blood and swine's blood of well-nigh equal value." Conrad Grebel, the first leader of the Swiss Brethren, said: "True, believing Christians are as sheep in the midst of wolves.... They . . . must reach the fatherland of eternal rest, not by overcoming bodily enemies with the sword, but by overcoming spiritual foes. They neither use the worldly sword nor engage in war, since among them taking human life has ceased entirely, for we are no longer under the old covenant." The Anabaptists recognized the state as ordained of God for the maintenance of order by means of the sword in the sub-Christian society of this world. They did not believe, however, that the disciple of Christ was called to perform this coercive function. The (Swiss Brethren) Schleitheim Confession of Faith, adopted in 1527, says: "The sword is ordained of God outside the perfection of Christ." The (Dutch Mennonite) Dordrecht Confession of 1632 says: "We believe and confess that the Lord Jesus has forbidden His disciples and followers all revenge and resistance, and has thereby commanded them not to 'return evil for evil, nor railing for railing'; but to 'put the sword into the sheath.' . . . Also, if necessity should require it, to flee, for the Lord's sake, from one city or country to another, and suffer the 'spoiling of our goods,' rather than give occasion of offense to anyone; and if we are struck on our 'right cheek, rather to turn the other also,' than revenge ourselves, or return the blow. . . . And we are, besides this, also to pray for our enemies, comfort and feed them, when they are hungry or thirsty, and thus by well doing convince them and overcome the evil with good." The old Anabaptist hymnal, the Ausbund, the Offer des Heeren, with the Lietboecxken of 1562, the oldest documents about the Dutch martyrs, and T. J. van Braght's Martyrs' Mirror, first published in 1660, are filled with accounts of the Anabaptists who suffered for their nonresistant faith. In the 18th century the Mennonites of Pennsylvania published new editions of these works with the avowed purpose of encouraging steadfastness and strengthening the faith of the brethren, "as the flames of war appear to mount higher." Since "no man can tell whether the cross and persecution of the defenseless Christians will not soon come, . . . it is therefore of importance to prepare ourselves for such circumstances with patience and resignation, and to use all possible means that can encourage steadfastness and strengthen faith." In 1775 during the American Revolution, following an appeal by the Pennsylvania Assembly to assist the country and its people in such manner as is consistent with their nonresistant faith, the Pennsylvania Mennonites and Dunkers in a joint petition thanked the Assembly for its advice and its liberality in granting freedom of conscience. The petition said the Mennonites and Dunkers were ready at all times to help those in need and distress, "it being our principle to feed the hungry and to give the thirsty drink; we have dedicated ourselves to serve all men in everything that can be helpful to the preservation of men's lives, but we find no freedom in giving, or doing, or assisting in anything by which men's lives art destroyed or hurt." On various occasions in the following 175 years similar sentiments were addressed to the American and Canadian governments by the American Mennonites, as in 1915, 1917, 1919, and other times. In 1937 the Mennonite Church (MC) at its biennial conference adopted a statement of position on Peace, War, and Military service, saying: "We are constrained as followers of Christ to abstain from all forms of military service and .. . support of war," from service in civil organizations allied with the military, from "the financing of war operations . . . through voluntary contributions," from participation in the manufacture of munitions and from making financial profit out of war. This statement also expressed a willingness "at all times to aid in the relief of those who are in need, distress or suffering, regardless of the danger in which we may be placed in bringing such relief, or of the cost which may be involved in the same. If our country becomes involved in war, we shall endeavor to continue to live a quiet and peaceable life in all godliness and honesty; avoiding joining in the wartime hysteria of hatred, revenge, and retaliation; manifest a meek and submissive spirit, being obedient unto the laws and regulations of the government in all things, except in such cases where obedience to the government would cause us to violate the teachings of Scriptures so that we could not maintain a clear conscience before God." Four years later the same group issued a declaration of the principle of nonresistance as applied to industrial relations: "We believe that industrial strife, unfair and unjust practices by employers or employees, and every economic and social condition and practice which makes for suffering or ill will among men is altogether contrary to the teaching and spirit of Christ and the Gospel." As a positive expression of nonresistance in the form of Christian love and service, and as an alternative to military service, the General Conference Mennonite Church statement says: "We . . . express our willingness . . . at all times to aid in the relief of those who are in need, distress or suffering, regardless of the danger in which we may be placed in bringing such relief, or of the cost which may be involved in the same. We are also willing to render such services as housing, road making, farming, forestry, hospitalization, and recreational work during time of war. Wherever we render such service it shall always be our purpose to spread the Gospel of Christ by word as well as deed." In Europe, following a long period of persecution for their nonresistant faith, the Mennonites experienced first a period of toleration and then in course of time a gradual loss of the principle for which the fathers had died. In Holland the latter tendency was first manifested as early as the late 17th century. This tendency in the first instance may have been caused in part by the influence of Calvinism, which was very great from the 17th century on, not only on the more liberal Lamists (who, for example, took over the Calvinist liturgy, pulpit, and organ), but also on the stricter Zonists, and in part by the worldliness and economic prosperity. Although a number of Dutch Mennonites performed military service during the Napoleonic wars (1796-1815) most of the leaders of the church were opposed to voluntary service in the army as late as 1850. At that time it was still possible to secure exemption from service by hiring a substitute. When the new law requiring military service was passed by the Dutch parliament in 1898, however, without any exceptions or special privileges for Mennonites, even the leaders of the church failed to offer any objections. By the first quarter of the 20th century individual Dutch Mennonites were holding important political positions, a Mennonite deacon even serving as Minister of the Navy, and during the time of World War I there was only one known conscientious objector among the Mennonites called up for military service in Holland. By this time the Dutch Mennonites as a whole were persuaded that the nonresistant position was no longer valid, although as late as 1890 such an important leader as Tjepke Kielstra took his stand firmly for New Testament nonresistance. In Switzerland the Mennonites suffered persecution for nearly three centuries, and were not granted complete religious toleration until 1815. Most of those who had not been put to death were driven out, eventually finding homes in Alsace, in the Palatinate, and many in America. As a result of the persecutions the few Mennonites who remained in Switzerland developed a spirit of self-depreciation and when that country adopted universal conscription in the mid-19th century those who did not emigrate to escape conscription accepted noncombatant service, which was their privilege, although by the mid-20th century about 15 per cent took full service. Officially, however, the Swiss Conference maintained the nonresistant position. Following the Napoleonic wars, conscription for military service became the universal practice on the continent of Europe. In Germany as elsewhere when this occurred those Mennonites who took their nonresistance most seriously migrated to new homes where their faith and their way of life would be respected. in the 1780s the Mennonites of West Prussia were required to give financial support to the military academy at Culm. They also suffered other forms of oppression, such as restrictions in land ownership. As a result of this situation large numbers of the Mennonites moved to Russia in 1788-1820, where they were exempt from military service. No doubt the Mennonites of West Prussia who migrated to Russia were those who took their nonresistance most seriously. Nevertheless, those who remained in West Prussia and the Vistula delta did not give up their position without a struggle. During the Napoleonic wars, for example, when one of the members of the Elbing congregation volunteered for service and fought at Waterloo, he was excommunicated. Following the enactment of the Prussian universal military training law in 1814 the Mennonites appealed for exemption, which was granted, but only on condition that they pay a heavy tax in addition to that paid for the support of the military academy. In the Revolution of 1848, when the Frankfurt Assembly drew up a constitution for the proposed new German confederation, a non-Mennonite delegate from Danzig suggested a provision for the exemption of Mennonites from military service. Astonishing as it may seem, however, a Mennonite delegate from Krefeld, in northwestern Germany, opposed the suggestion, with the result that it was turned down. Since the proposed German confederation did not materialize, the new constitution never went into effect. From what happened at the Assembly, however, it is clear that the influence of the Mennonites of the Lower Rhine, who were rapidly losing their nonresistance, made it more difficult for their brethren of northeastern Germany to maintain their faith. In the 17th century large numbers of persecuted Mennonites had also moved from Switzerland into the Palatinate and other parts of southern Germany. They continued to suffer many hardships here, however, both from persecution and from the wars at the end of the century. As a result, many of these South German Mennonites moved to America in the first half of the 18th century. As the pressure of militarism increased and opportunities for migration opened up, some Mennonites of all parts of Germany continued to migrate to America and to Russia during the late 18th and the 19th centuries. The end of full nonresistance among the Prussian and all of the North German Mennonites came following the founding of the North German Confederation in 1867. In that year a new universal military service law was enacted, with no exemption for Mennonites. After the law was passed the Mennonites appealed to Berlin, but the only concession they received was the cabinet order of March 3, 1868, permitting noncombatant military service for those who had scruples against regular service. After the cabinet order was issued many of those Mennonites who were genuinely nonresistant migrated to Russia and America. Those who remained at first accepted noncombatant military service. This was especially true of the North German Mennonites after the cabinet order of 1868. It soon became clear, however, that there was little difference in principle between noncombatant and regular service. As a result, the Mennonites of Germany gradually gave up all objection to army service, and in World War I most Mennonites in the army were in the regular service. Only a few chose the noncombatant service provided for by the law, although about one third of those in West Prussia did so. Thus, for more than a century the process of adaptation went on until it culminated in the almost complete abandonment of the nonresistant faith by the Mennonites of Germany. Before the opening of World War II (1934) in fact, the Vereinigung der Mennonitengemeinden im Deutschen Reich, the official conference which included the churches of northern Germany and the Palatinate, had taken official action openly disavowing the nonresistant position by stating that the privilege of exemption from full military service would no longer be claimed. The Mennonites of Germany as a whole had become convinced that the old Mennonite position was no longer valid, and that they owed it to their country to assume the full burden of citizenship like their fellow citizens. The older status of exemption had been based upon the conception of the Mennonites being a special class of citizens, with limited rights and exceptional privileges. Ernst Crous has shown (MQR 25, 241-44) that the process of accommodation by which the German Mennonites changed their convictions on nonresistance seemed right and good to them and was not viewed as compromise, although viewed historically it appears as such. In France the story is much the same as elsewhere in Europe. After 1870 the French military laws made no provision whatever for conscientious objectors, and military service came to be generally accepted by the Mennonites in that country. From 1870 to 1914 Alsace, being annexed to Germany, was subject to German military law. When the Mennonites migrated from Prussia and elsewhere in western Europe to Russia during the latter part of the 18th century the principle of nonresistance was one of the factors responsible for the move. When they came to Russia they, like all other German immigrants, were guaranteed complete exemption from military service. This policy of exemption was continued according to promise until 1870. In that year, however, the Russian government issued a ukase abolishing all special privileges to non-Russian settlers in South Russia, including exemption from military service effective in 1880. The imperial edict caused great concern among the Mennonites, and from the beginning some of them considered the situation serious enough to warrant emigration. Numerous official delegations were sent to St. Petersburg in 1871-73 with appeals to the government to withdraw its order regarding military service. As these efforts proved fruitless, however, an emigration to America, which began in a small way in 1873, actually assumed mass proportions in the following year. In 1873 the total population of the Mennonites in Russia was 45,000, and before the migration movement was concluded one third of this number had gone to the prairie regions of the United States and Canada. The Russian government now became alarmed, realizing too late that it had not taken Mennonite nonresistance seriously enough. Determined to hold as many of them as possible the Tsar sent General von Todtleben to the colonies in April 1874. After acquainting himself with the faith and the convictions of the Mennonites he offered them civilian service of an entirely nonmilitary character as an alternative to military service. The result was the alternative forestry service program for conscientious objectors operated by the Mennonites under the Russian government from 1880 through World War I and financed by them. By the time of World War I the annual enrollment in this service was about 1,000 men. During the war itself about 12,000 Mennonites were engaged in government service, about 6,000 in the forestry and another 6,000 in the Mennonite hospital and medical corps. Practically no Mennonites entered the army. The coming of the Russian revolution in 1917 following three years of war proved to be a very severe test for the nonresistant faith of the Russian Mennonites. In 1918 some Mennonites in the Ukraine organized a Self-Defense Corps (Selbstschutz) at the suggestion and with the help of officers of the German army of occupation. There was some actual fighting between armed Mennonites and groups of Russian bandits. This serious lapse no doubt increased the difficulties experienced by Russian Mennonites who were sincerely and genuinely nonresistant, and who were the great majority. Some form of alternative service was granted by the Soviet government upon individual application quite regularly down to 1927, on the basis of the Lenin decree of 1919 (which has never been repealed). Thereafter it became increasingly difficult, although cases are known to have been granted as late as 1935. In some cases also the CO's are reported to have been shot, and in other cases the alternative service amounted to forced labor in concentration camps. Many of the Mennonite men who were brought out of Russia in 1943 by the German army of occupation were drafted into the German army. From the time of the first Mennonite immigration to America in the late 17th century to the present time, concern for the principle of nonresistance has always been a major cause for the emigration of Mennonites from Europe. This was especially true after the introduction of universal military service in Europe by Napoleon early in the 19th century. The coming of the Swiss Mennonites and the Alsatian Amish to Ohio, Indiana, Illinois, and Iowa in the mid-19th century are cases in point. Further illustrations would be Mennonite groups coming from Prussia to Kansas and Nebraska as well as other Mennonites and Amish groups from Germany to Pennsylvania, Ohio, Illinois, and Iowa. By far the largest migration before World War I was that from Russia in the 1870s, and this was brought about almost entirely by the Russian threat to the nonresistant way of life of the Mennonites. These successive waves of immigration accordingly strengthened the American Mennonite devotion to the principle of nonresistance. Although there have always been individuals who did not follow the teachings of the church, the American Mennonites during the wars from the 18th to the 20th centuries have maintained a fairly consistent testimony against military service. The nonresistant faith of the Pennsylvania Mennonites was not only stated in their declaration to the Pennsylvania Assembly in 1775; it was also demonstrated by the assistance and relief which they brought to the war sufferers of that time. There were also numerous cases of Mennonites on the American frontier in colonial times who suffered in various ways, some of them even being murdered at the hands of hostile Indians, such as in Page County, Va., and Berks County, Pennsylvania. In all of these trials there is no case on record of any Mennonite using force against the enemy. In 1789 Benjamin Rush said: "Perhaps those German sects of Christians among us who refuse to bear arms for the purpose of shedding human blood, may be preserved by divine providence as the center of a circle, which shall gradually embrace all nations of the earth in a perpetual treaty of friendship and peace." The period before the Civil War (1860-65) was one of spiritual decline among the American Mennonites. For a long time no peace literature had been produced and in many cases the young men were not prepared to meet the test of war and conscription when it came, and a considerable number of them accepted military service. This failure became the occasion for a revival of teaching on nonresistance and a cause for a great awakening in the Mennonite Church. In June 1863 appeared two little booklets on nonresistance, "the first trickles of a stream of literature that has flowed into the church in growing volume since." One was entitled, Warfare, its Evils, Our Duty, and was written by John F. Funk, the young minister who was to found the Herald of Truth in Chicago the following year. The other, entitled Christianity and War, was written by John M. Brenneman, Mennonite minister of Elida, Ohio. The Herald of Truth which began publication in January 1864, promoted the cause of nonresistance from the very beginning. In an editorial in the January 1865 issue of the Herald, Funk discussed various alternatives to military service and evaluated them as to their consistency with the nonresistant faith. He presented a convincing case against the hiring of substitutes. "It is now generally admitted to be wrong," he says, "and there is probably scarcely a single one who professes to hold to the doctrine of nonresistance, that would be willing to send a man to do that which he himself . . . considers altogether against the gospel of Jesus Christ." While the testimony of the church leadership was clear on the question of hiring substitutes, there is evidence of confused thinking on the matter of the commutation fee, service to sick and wounded soldiers, and noncombatant service in the army which some accepted, both in the North and in the South. The church at that time showed a weakness in not being able to grapple adequately, on the basis of its own principles, with the issues at hand. The considerate attitude of the government, however, especially in the North, in recognizing the scruples of nonresistant people when they were effectively presented, makes it seem certain that if the Mennonites had been sufficiently advanced in their thinking to conceive and promote a comprehensive program of civilian alternative service in harmony with their principles, it would have been granted them. As it was, however, such a program was not developed until the time of World War II. During the Civil War the Mennonites of Virginia, located within the Confederacy, were very hard pressed. Much of their property was destroyed. Some of them suffered imprisonment. Some remained in hiding in the mountains for months at a time. Others managed to escape to the North where some of them remained permanently. The vigorous leadership of Bishop Samuel Coffman, who stood courageously for the nonresistant faith at the risk of his own life, enabled the Mennonite Church in Virginia to maintain a fairly consistent nonresistant record, considering the seriousness of the military situation and the period in the history of the church when these events occurred. The great awakening in the Mennonite Church (MC) which followed the Civil War, and the spiritual developments of the next half century, prepared the Mennonites of America to meet the problems of World War I with greater effectiveness than they did those of the Civil War. When the war came a firm position was taken against noncombatant as well as combatant military service, and the wartime experience was such as to clarify effectively the issues here at stake and to gain the recognition of the government for the principle of nonresistance as well as its cooperation in an effort to find acceptable alternatives for military service. Relief and reconstruction work abroad in the last year of the war and immediately following (1917-19), the farm furlough, and proposals near the end of the war for the assignment of conscientious objectors to projects of land reclamation and agricultural and educational service helped to set the pattern for later Civilian Public Service and comprehensive relief and voluntary service programs, both home and foreign, developed during and following World War II, which functioned both as an alternative to military service and as a positive service and witness for peace in the modern world. In World War I the total number of objectors in the United States who were court-martialed and sentenced was 503. Of these, 360 were religious objectors; and of the latter, 138 were Mennonites. Prison sentences ranged all the way from one year or less to life. Life sentences were given to 142 men, and 17 men were even sentenced to death. Sentences from five to thirty years were very common. None of these severe sentences were fully served. Within a few months after the close of the war most of the prisoners had been given their freedom by Presidential pardon. The darkest chapter in the entire story of the treatment received by the conscientious objectors in World War I is that of the four Hutterian Brethren -- Joseph, Michael, and David Hofer, and Jacob Wipf. After spending two months in the guardhouse in a military camp these four men were court-martialed and sentenced to twenty years' imprisonment. They were taken to Alcatraz federal prison in California, where they suffered very cruel treatment, from which Joseph and Michael Hofer died. The brotherhood in the home community was also tested. In some communities Mennonites were most severely criticized, and even abused. In Kansas and Illinois and in other places a number of meetinghouses were painted yellow. In at least two cases meetinghouses were burned to the ground. In Kansas several men were tarred and feathered because of their nonresistant objection to the purchase of bonds. One minister in Ohio was dragged from his home at night, and his hair was clipped from his head. In South Dakota a mob, with the connivance of a local bond committee, actually robbed the Hutterian community of livestock worth $40,000. This, with other abuses, was responsible for driving the Hutterites out of the state into Canada. No doubt this is the worst example, but it would be possible to enumerate cases of mistreatment and mob violence by the score. One of the effects of World War I was to arouse all of the peace churches to the need for an aggressive program of peace teaching and peace action. The various Mennonite groups appointed official peace committees who were responsible for carrying on this program. The Church of the Brethren and Friends groups did likewise. Following the war, the amount of peace literature produced by all of these groups was greater than ever before in their history. Peace conferences sponsored by the peace groups, both individually and cooperatively, were a common thing during this period. The most important of the cooperatively sponsored meetings was that held at Newton, Kansas, in 1935, at which time the name "Historic Peace Churches" was first used. This meeting created an unofficial Continuation Committee (the Mennonite member appointed by the Mennonite Central Committee) whose duty it was to plan for future conferences and to guide the co-operative efforts of the Historic Peace Churches. Among these co-operative efforts was the bringing of a testimony for the Christian way of peace to the official bodies of other Christian denominations. In 1937 representatives of the Historic Peace Churches called on President Franklin D. Roosevelt, each of the three groups (Mennonites, Friends, and Brethren) presenting a letter stating its views on war and peace, and refusal to bear arms. A similar delegation visited the President again on 10 January 1940, with concrete proposals for alternative service in case universal military training and service should be adopted. In 1939 various Mennonite groups, realizing the need for a united position, organized the Mennonite Central Peace Committee, which then drafted a proposed plan of action in case of war; this plan received official approval on 30 September 1939. The other Historic Peace Churches also gave official approval to this plan of action. As a result of these efforts the provision for conscientious objectors in the U.S. Selective Training and Service Act of 1940 was more generous and satisfactory than that of the draft law of 1917. Under the new law all persons "who, by reason of religious training and belief," were conscientiously opposed to all forms of military service, should, if conscripted for service, "be assigned to work of national importance under civilian direction." The implementation of this law resulted in the Civilian Public Service (CPS) system of World Wax II and in the revised civilian work program inaugurated in 1952. The experience of both of the world wars served to stimulate and expand the Mennonite relief and service programs as forms of a positive world-wide witness for peace. The reconstruction work in France, followed by the Near East Relief and the Russian famine relief, were supported by the Mennonites both with funds and personnel. The latter project led to the formation in 1920 of the Mennonite Central Committee, which has become the great relief and service organization of North American Mennonitism, and which has also carried the banner of a united Mennonite nonresistance testimony. The total amount contributed by the American Mennonites and distributed through its own organizations for the relief of war sufferers in Europe and the Near East during the period of World War I and immediately afterwards is estimated at about $2,500,000. The Mennonites of Holland also contributed several hundred thousand dollars for the work in Russia. During the Spanish Civil War (1937), the American Mennonites (MC) carried on a relief work in that country, contributing about $57,000. This record of work in migration, relief, voluntary service, and civilian service of North American Mennonites as an alternative to military service from 1940 on constitutes a 20th-century Mennonite peace testimony which is world-wide in its scope. The story of the Mennonite migrations for conscience' sake has attracted wide attention, and their relief and humanitarian service projects have touched many countries on every continent on the globe, except Australia. Their record as conscientious objectors in the United States and Canada is likewise well known. This world-wide witness was bound to have a profound effect upon the Mennonites themselves. It gave them a new vision of their own faith and life, and of the Anabaptist contribution to theology, and brought a deepened conviction that the Christian Gospel and the message of love and nonresistance which according to the New Testament is an integral part of it were sorely needed in their world. Those Mennonites who had formerly given up their nonresistant faith were challenged to espouse it once more, which some of them did. Even as early as 1915 a spirit of renewal was beginning to stir among the Mennonites of the Netherlands, which by 1950 had done much to turn the church in the direction of its original evangelical and nonresistant principles. This spirit was first symbolized by Jan Gleijsteen, the one and only Dutch Mennonite who took his stand as a conscientious objector when called up for military service during World War I. Gleijsteen served a term in prison for taking this stand. At the same time some young ministers, T. O. Hylkema, J. E. van Brakel, and J. M. Leendertz, through a study of the Bible and church history, began to find their way to the early and historic position of the Dutch Mennonite church on nonresistance and related Biblical principles. In this they were helped to some extent by their contacts with the English Quakers at Woodbrooke. In 1917 Hylkema and his associates organized the Gemeentedag movement, the aim of which was to bring the church to a more thoroughly Biblical faith. Included in its emphasis was nonresistance. During the 1920s and 1930s there gradually developed among the Dutch Mennonites a vigorous body of opinion opposing military service and militarism. In 1922 this led to the formation of a Committee against Military Service (Arbeidsgroep) with over 300 members, which some fifteen years later prepared a Mennonite peace manifesto, appealing to its members "to witness vigorously to our peace testimony in our congregations everywhere," and calling "all Mennonites throughout the world to fulfill the task entrusted to us by the history of our Mennonite forefathers, in the propagation of the Gospel of peace." This Manifesto, signed by representatives of Mennonites in various countries at the organization of an International Mennonite Peace Committee in the summer of 1936 following the third Mennonite World Conference, was widely circulated among the Mennonites of the world. By adopting pertinent legislation in 1926 the Dutch government liberalized its military laws so as again to give some recognition to conscientious objectors. Following the war a program of alternative service was inaugurated, with service camps for conscientious objectors similar to those in the United States. The program included service in mental hospitals and other similar assignments. In 1952 several hundred Dutch conscientious objectors were engaged in this service, about thirty of them being Mennonites. In 1952 also two Dutch Mennonites whose CO position was not recognized by the government were serving prison sentences. Following the war the organized peace work of the Dutch Mennonites also underwent some change. The earlier Committee against Military Service became the Mennonite Peace Group (Doopsgezinde Vredesgroep). This change of name symbolized a changing emphasis in the group's peace teaching and peace work. If the earlier emphasis was largely one of antimilitarism, the later emphasis was increasingly that of Biblical nonresistance, so that by 1950 the Biblical position was dominant in the Dutch Mennonite peace movement. The fact that by 1953 the Peace Group had a membership of nearly 700 members, among whom were 32 per cent of the Dutch Mennonite ministers, is evidence enough that Dutch Mennonitism had made much progress in the recovery of its earlier faith. The International Mennonite Peace Committee mentioned above was organized following the third Mennonite World Conference in Holland in the summer of 1936. Participating in the formation of the new organization were members of the Dutch Mennonite Committee against Military Service and representatives of several peace committees from North America. Harold S. Bender of the United States was chosen chairman of the committee, and Jacob ter Meulen of the Netherlands secretary-treasurer. The achievements of the new organization, however, were very modest. Moreover, with the coming of World War II the connections between America and Holland were broken, so that the International Mennonite Peace Committee became inactive. In the summer of 1949, however, an international Mennonite Peace conference in Holland provided the occasion for its revival. In its reorganized form Harold S. Bender again became chairman, and Carl F. Brüsewitz of Holland was chosen secretary. It has continued in a modest program of activity to the mid-1950s. In Holland the Peace Group, with the help of American Mennonites, established a peace center at Heerewegen near Deist. The most significant feature of the 1949 conference, however, was the presence of representatives of the German, French, and Swiss Mennonites, as well as those of Holland and America. Representatives from each of these countries were also named officials of the new organization. The new organization held a second international Mennonite peace conference at Heilbronn, Germany, in the summer of 1950, and a third conference in France in 1951. In 1952 it held a meeting in connection with the Fifth Mennonite World Conference in Basel. Several similar meetings have been held since then. The participation of the German, French, and Swiss Mennonites in this movement was of much significance, indicating a growing interest in nonresistance. However, even in 1957 it was uncertain whether or not this interest would grow into a movement as significant as that of the Dutch Peace Group. The leaders of the movement in these countries were only a few, and their following was not large. And yet there were signs that the movement had genuine life. In Germany a peace conference for German Mennonites was held in 1949. In both 1949 and 1950 the question of nonresistance was discussed at official conferences of the German Mennonites. The constitution of the new West German Republic provided that no one should be compelled against his conscience to perform military service. When the question of remilitarization arose, the German parliament took steps to enact legislation to implement this constitutional provision, and the German churches were given the opportunity of stating their position on conscientious objection. In 1950 the German Mennonite conferences officially went on record as supporting the position of the conscientious objector. This did not necessarily mean that the great body of German Mennonites had come to accept nonresistance in faith and practice once more. It did mean, however, that those who took that position would have the support of the church. Moreover, the editor of the official South German Mennonite periodical, the Gemeindeblatt, was personally committed to nonresistance; and in the middle of the century the pages of this periodical were carrying articles on nonresistance by influential members of the church. Inductions into the new German army were scheduled to begin in 1957. In the meantime a German Mennonite Peace Committee had been organized, which in turn was represented on the Central Agency for Conscientious Objectors organized by the various peace groups for handling objector affairs with the German government similar to the operations of the National Service Board for Religious Objectors in the United States. Under the German conscription system men registering as conscientious objectors were to be examined by twelve regional committees and if their claims were recognized were to be assigned to civilian service under the Labor Ministry of the federal government. Government-operated camps were to provide projects in land reclamation, disaster service, health services, and construction of welfare and charitable institutions. Private agencies were also to be licensed for giving alternative service employment to objectors. At the time of this writing it was impossible to know the extent to which the German Mennonites would take their position as conscientious objectors under the provisions of the new law. By 1948 the editor of the French Mennonite periodical, Christ Seul, was also committed to nonresistance, and his journal likewise promoted the cause. He was also an influential evangelist and youth leader whose sincere peace convictions showed signs of bearing fruit. He, along with several other French Mennonites, had notified the government that although they had previously served in the army they could not do so again. Youth meetings were discussing nonresistance, and even an all-day conference of the French Mennonite ministers in the summer of 1950 was devoted to a consideration of the ancient nonresistant testimony of the church, an event without precedent within the memory of those present. This meeting revealed in interest in testifying to the French government against its intolerant attitude toward the conscientious objector, which later was done. Present at the French ministerial conference were also representatives of the Swiss Mennonites, including the president of their conference, indicating a serious interest in nonresistance on their part. That in the mid-20th century a new interest in nonresistance had been aroused in the European Mennonite churches there could be no doubt. In all of this the European Mennonite peace leaders were working closely with the American Mennonites. In the summer of 1949 three representatives of the peace section of the MCC, Harold S. Bender, Erland Waltner, and Cornelius J. Rempel, spent several months in Europe on a preaching mission, holding conferences and doing what they could to encourage their brethren in the recovery of their nonresistant witness. During the year 1949-50 Guy F. Hershberger served in a similar way, his work including a study of the general pacifist movement in Europe. In the summer of 1951 Bender and Waltner engaged in a second preaching mission and, in addition to their labors among the Mennonites, participated in conferences with peace leaders in the German evangelical churches. Similar missions were sent to the Mennonite colonies in South America about the same time. This outward reach of the Mennonite peace witness into the general Christian peace movement was manifesting itself in a number of ways. The Dutch Mennonite Peace Group was making its influence felt upon Dutch Christianity in general. Since 1949 the Dutch Peace Group and American Mennonites had been holding occasional conferences with representatives of the Friends and the Church of the Brethren in Europe, and a European Historic Peace Church Continuation Committee was organized in that year, with the British Friends, the European representatives of the Brethren Service Committee, and MCC workers (plus later representatives of the Dutch Peace Group) participating. A conference of these groups in 1950 took steps toward the presentation of the concerns and convictions of the Historic Peace Churches to the World Council of Churches before the time of its world conference in 1953. This presentation was made in the form of a booklet Peace is the Will of God (Amsterdam, 1953). Since then the European Mennonite peace witness and work has continued under the leadership of the International Mennonite Peace Committee assisted by American MCC workers John H. Yoder, Albert Meyer, Ernst Harder, Milton Harder, Paul Bender, and others. In the summer of 1957 a number of peace conferences were held in meetings associated with the sixth Mennonite World Conference. At the same time the Mennonites of the Latin-American countries were also growing increasingly conscious of their responsibility to strengthen the witness of peace among themselves, and to make that witness felt beyond their own circles through the publication of peace literature and by other means. This was true both of the Mennonite colonists who had recently settled there as immigrants, and of the Mennonite missions in those parts. The same was also true of Mennonite missions in Africa, India, and in other parts of the world. During 1955-57 Melvin Gingerich gave a two-year term of service under the Peace Section of the MCC bringing the peace witness to the people of Japan, working with Japanese Christians and peace workers in that country. In September 1957 he was succeeded by Paul Peachey in this ministry. Thus at the middle of the 20th century there was a growing conviction among Mennonites that nonresistance was an integral part of the Gospel of Christ. And the Mennonite peace witness was growing ever more world-wide in its scope. Another effect of the growing interest in the Christian peace testimony was a deepened concern among Mennonites for the wider social implications of the Gospel and of the principle of nonresistance in particular. "A declaration of Christian faith and commitment," adopted by a study conference called by the Peace Section of the MCC at Winona Lake, Ind., in 1950, says: "We ... have the responsibility to bring to the total social order ... the utmost of which we are capable in Christian love and service. . . . For this reason the social order, including our own segment of it, must be constantly brought under the judgment of Christ. . . . We must practice an increasingly sharper Christian control of our economic, social, and cultural practices among ourselves and toward others, to make certain that love truly operates to work no ill to our neighbor, either short-range or long-range. Knowing how much the selfishness, pride, and greed of individuals, groups, and nations, which economic systems often encourage, help to cause carnal strife and warfare, we must see to it that we do not contribute thereto, whether for the goals of direct military operation or to anything which destroys property or causes hurt or loss of human life." In 1951 a conference at Laurelville Mennonite Camp, sponsored by the Committee on Industrial Relations of the Mennonite Church (MC), adopted "A statement of concerns" which said: "We are further concerned that the church should acquire a better understanding of the principles of social justice contained in the Gospel of Christ, and urge our preachers and teachers to study and to set forth the social obligations expressed and implied in the teachings of the Old Testament prophets, of our Lord, and of all the apostles. We are deeply concerned that the social conscience of all our people may be aroused and sharpened, so that we may sense more and more the implications of Christian love and brotherhood in the complex details of modern life. We believe that our Christian testimony to the world about us can be effective only as we confess unsocial conduct to be sin and cleanse our lives of its defilement." "A declaration of Christian faith and commitment with respect to peace, war, and nonresistance," adopted by the Mennonite Church (MC) in 1951, repeated the admonition of the Winona Lake statement to "practice a sharper Christian control of our economic, social, and cultural practices," and added that "Christian love must hold primacy in all our economic and labor relations, that we cannot participate in activities, organizations, investments, or systems which use the methods of force and violence, compromise Christian ethics, or do not permit the full exercise of Christian love and brotherhood, and that we seek in our own practices to work out this love and brotherhood in concrete applications." In 1955 the Committee on Economic and Social Relations sponsored a study conference on Christian race relations which drafted a statement which later that same year was officially adopted by the Mennonite Church (MC). This statement, "The Way of Christian Love in Race Relations," condemned racial prejudice and discrimination as a sin, as "a violation of the basic moral law which requires a redemptive attitude of love and reconciliation toward all men," and as "a major cause of present-day international conflict and war" in which a nonresistant people can have no part. The simple command of Jesus in Matthew 5:39, "resist not evil," is the source for a foundational category in Mennonite ethical thought -- nonresistance. The 16th century European Anabaptists spoke of Gewaltlosigkeit (literally, the abstaining from the use of force), meaning the refusal of violent self-defense and the rejection of military service. In early 19th century America, "nonresistance" became for a time the label used by pacifist abolitionists such as Adin Ballou and W. L. Garrison (of the New England Non-Resistance Society), but their politically aggressive movement had little in common with the quietist rural Mennonites. American Mennonites first faced military conscription during the Civil War. The church was poorly prepared to deal with this challenge and many young men accepted military service. This experience evoked a revival of nonresistance teaching. Booklets by John F. Funk and John M. Brenneman appeared in 1863. The 1864 tract by Reformed Mennonite Daniel Musser, "Non-resistance asserted," later came to the attention of Leo Tolstoy. World War I again tested the nonresistant convictions of American Mennonites and became the occasion for renewed emphasis on the doctrine. Significant exponents of nonresistant teaching from the first part of the 20th century include John Horsch, Daniel Kauffman, H. P. Krehbiel, C. Henry Smith, and Edward Yoder. Guy F. Hershberger, at mid-century the chief interpreter of the theme, described nonresistance as " the term which in Anabaptist-Mennonite history has come to denote the faith and life of those who believe that the will of God requires the renunciation of warfare and other compulsive means for the furtherance of personal or social ends" (see Nonresistance (1956)). Nonresistance means "pouring out one's love without reserve, even as Christ poured out His life completely on the cross for His enemies" (Way of the Cross, 41). Thus the word became synonymous with the way of suffering love as exemplified in Jesus. In Hershberger's formulation, nonresistance had implications for every area of life. Beyond personal relations in the Christian community, it was also the guideline for industrial, legal, political, and economic relations, as denominational statements on these issues, especially from the 1940s and 1950s, testify. Its normative expression included refusal to sue at law or to join labor unions. Always more than a merely negative stance, nonresistance was extended to include positive activities of Christian service, grounded in a community of faith. Nonresistance was taught as the only authentic biblical and Anabaptist norm, consistent with the nonpolitical "two kingdom" theology of the Schleitheim Confession. In its practical implications, however, this ethic also enabled a prophetic witness that helped move the church into more active forms of social service and witness in the wider world, even into areas of political activism. Up to the 1950s, practically all Mennonites saw their nonresistant stance as distinct from both pacifism and nonviolence. Nonviolence was viewed as a tool of the liberal religious pacifist movement, derived from the efforts of Gandhi in his struggle for Indian self-determination. Nonviolence was a human strategy of coercion used to obtain a specific social goal, though without the use of physical force. Critics have labeled classic Mennonite nonresistance as psychological asceticism, resulting in an unhealthy stance of withdrawal and self-denial. Moreover, it is an inadequate social ethic, unable to respond to competing neighbor claims or to the need for the protection of third parties. The larger questions of justice and social responsibility are bypassed in order to preserve personal purity, it is alleged. In the generations since 1955, these challenges have been addressed by Mennonite scholars. J. Lawrence Burkholder and Gordon Kaufman led the way in questioning the adequacy of the traditional ethic for responding to the changing social context of Mennonite communities, no longer isolated from modern society, and to the urgent needs of the postwar world. They along with others argued that the traditional stance was too narrow and simplistic to cope with such problems as the threat of nuclear weapons and third-world revolutions. With the growth of civil rights activism and the 1955 Montgomery, Alabama bus boycott, Mennonites became aware of a new form of nonviolent action for social justice. This emerging movement, nurtured in the black churches and led by Martin Luther King, Jr., was cautiously appraised by Hershberger as more of "a strategy of appeal and less one of compulsion, and thus would seem more nearly to approach New Testament nonresistance." New developments in Biblical scholarship also enabled change. Hershberger (and others such as H. A. Fast) depicted the purpose of Jesus in purely nonpolitical terms. But the newer studies uncovered the political dimensions of Jesus' ministry in its historical setting. Although never approving physical violence to people, the Jesus of the gospels aggressively engages the sociopolitical issues of his time. He is the leader of a movement rooted in the faith of Israel and directed to concrete needs and expectations, modeling a strategy for social action that is neither escapist nor violent. John H. Yoder's The Politics of Jesus, solidly grounded in current biblical exegesis, became the landmark study on this theme, gaining recognition far beyond Mennonite circles. Lawrence Burkholder in his writing demonstrates that both nonresistance and nonviolent resistance are to be found in the ministry of Jesus. The basic ethical criterion of this emerging position is the rejection of violence. Nonviolent resistance in a just cause, particularly for the sake of others rather than self, can be an expression of Christian love. But a faithful follower of Jesus will always accept suffering, even death, rather than do injury to others. An Annotated Bibliography of Mennonite Writings on War and Peace, 1930-1980, ed. Willard Swartley and Cornelius J. Dyck. Scottdale, PA: Herald Press, 1987. Bender, Wilbur J. Nonresistance in Colonial Pennsylvania. Scottdale, PA: Mennonite Publishing House, 1934. Bremer, H. De basis van ons weerloos Christendom. N.p., n.d., 1952. Burkholder, J. Lawrence. "The Problem of Social Responsibility From the Perspective of the Mennonite Church." Th.D. diss., Princeton Theological Seminary, 1958; published Elkhart: Institute of Mennonite Studies, 1988. Burkholder, J. Lawrence. "Nonresistance, Nonviolent Resistance, and Power" in Kingdom, Cross, and Community, ed. by J. R. Burkholder and Calvin Redekop. Scottdale, PA: Herald Press, 1976: 131-137. 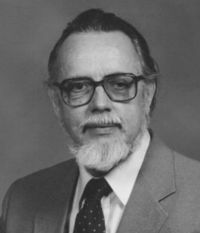 Burkholder, John Richard. Continuity and Change: a Search for a Mennonite Social Ethic. Akron PA: Mennonite Central Committee, 1977. Burkholder, John Richard. "A Perspective on Mennonite Ethics," in Kingdom, cross, and community, ed. by J. R. Burkholder and Calvin Redekop. Scottdale, PA: Herald Press, 1976: 151-166. Crous, E. "Germany," Mennonite Encyclopedia II, 495-97. Crous, Ernst. "The Mennonites in Germany Since the Thirty Years' War." (section on nonresistance) Mennonite Quarterly Review 25 (1951): 241-244.
de Hoop Scheffer, J. G. Inventaris der Archiefstukken berustende bij de Vereenigde Doopsgezinde Gemeente te Amsterdam, 2 vols. Amsterdam, 1883-1884: v. 1, Nos. 428 f., 431, 433, 436 f., 441, 453 f., 570-84, 887, 1471, 1559, 1638, 1736, 2359, 2471; v. ll, Nos. 2994, 3290 f., 3293-3319; v. II, 2, Nos. 37, 211-15, 309-12, 330. De Zondagsbode (10 January 1915). Detweiler, Richard C. Mennonite Statements on Peace, 1915-1966. Scottdale, PA: Herald Press, 1968. Doopsgezinde Bijdragen (1864): 113, 115 f.; (1867): 103; (1873): 144; (1877): 17 et passim; (1878): 29; (1879): 27 et passim; (1880): 53, 56-60; (1881): 1-32, 87; (1882): 91-94; (1883): 35; (1884): 33; (1887): 120; (1891): 20; (1898): 123-49; (1903): 94; (1904): 45, 53 f.; (1905): 23 f.; (1907): 128-33, 157, 160; (1908): 36-47, 114; (1909): 154 f.; (1910): 9, 22; (1919): 39-41, 63-67. Dyserinck, J. "De weerloosheid volgens de Doopsgezinden." De Gids 1 (1890): 104-61 and 303-42. Erfahrungen der Mennoniten in Canada während des zweiten Weltkrieges--1939-1915. Steinbach, MB, 1948. Fast, Henry A. Jesus and Human Conflict. Scottdale, PA: Herald Press, 1959. Froese, Peter. Liebreiche Erinnerung von der Wehrlosigheit. 1850. General Conference Mennonite Church. "The Way of Peace," an official statement in 1971. Gingerich, Melvin. Service for Peace: a History of Mennonite Civilian Public Service. Akron, PA: Mennonite Central Committee, 1949. Gingerich, Melvin. What of Noncombatant Service. Akron, PA: Mennonite Central Committee, 1949. Hershberger, G. F. Christian Relationships to State and Country. Akron, PA : Mennonite Central Committee, 1942. Hershberger, G. F. The Mennonite Church in the Second World War. Scottdale, PA: Mennonite Publishing House, 1951. Hershberger, G. F. Nonresistance and the State, the Pennsylvania Quaker Experiment in Politics 1682-1756. Scottdale, PA: Mennonite Publishing House, 1936. Hershberger, Guy F. The Way of the Cross in Human Relations. Scottdale, PA: Herald Press, 1958. Hershberger, Guy F. War, Peace, and Nonresistance. Scottdale, PA: Herald Press, 1944, 1953, 1969. Horsch, John. Die biblische Lehre von der Wehrlosigkeit. Scottdale, PA: Mennonite Publishing House, 1920. Horsch, John. The Principle of Nonresistance as Held by the Mennonite Church. Scottdale, PA: Mennonite Publishing House, 1927. Hylkema, T. O. Wat de Bijbel zegt: Dienende weerlose liefde? ... Of niet? N.p., 1953. Kaufman, Gordon. Nonresistance and Responsibility, and Other Mennonite Essays. Newton, KS: Faith and Life, 1979. King, Martin Luther, Jr. Stride Toward Freedom. New York: Harper and Row, 1958. Krahn, Cornelius, J. Winfield Fretz, and Robert Kreider. "Altruism in Mennonite Life" in Pitirim A. Sorokin's Forms and Techniques of Altruistic and Spiritual Growth. Boston, 1954. Krahn, Cornelius. "Public Service in Russia." The Mennonite 58 (8 June, 22 June, 31 August, and 21 September 1943. Krehbiel, Edward. Nationalism, War and Society. New York, 1916. Krehbiel, H. P. War-Peace-Amity. Newton, KS 1937. Leendertz, J. M. Een Doopsgezind getuigenis tegen militair geweld. Wolvega, n.d., 1924. Leendertz, J. M. and T. O. Hylkema. Nieuw Leven in een Oude Broederschap. N.p., 1956. Mannhardt, W. Die Wehrfreiheit der Altpreussischen Mennoniten. Marienburg, 1863. Peace is the Will of God. Amsterdam, 1953. Peace Study Conferences, Moundridge 1953, Winona 1950, etc. Reimer, Gustav and G. Gaeddert. Exiled by the Czar. Newton, KS, 1956. Smith, C. H. Christian Peace: Four Hundred Years of Mennonite Peace Principles and Practice. N.p., 1938. Smith, C. Henry. The Story of the Mennonites. Newton, KS 1950. Smucker, Don. E. "The Theological Basis of Christian Pacifism." Mennonite Quarterly Review 27 (1953): 63-86. Sudermann, Jacob. "The Origin of Mennonite State Service in Russia 1870-1880." Mennonite Quarterly Review 17 (1943): 23-46. Swalm, E. J. Nonresistance Under Test. Nappanee, IN 1938. Toews, John A. True Nonresistance Through Christ. Winnipeg, MB, 1955. Toews, Paul. "The Long Weekend or the Short Week: Mennonite Peace Theology, 1925-1944." Mennonite Quarterly Review 60 (1986): 38-57. Unruh, John D. In the Name of Christ: a History of the Mennonite Central Committee and Its Services, 1920-1951. Scottdale, PA: Herald Press, 1952.
van der Zijpp, N. De vroegere Doopsgezinden en de Krijgsdienst. Wolvega, 1930. Vos, K. De Weerloosheid volgens de Doopsgezinden. Geschr, t.b.v. de Doopsgezinden in de Verstrooiing, No. 52 Amsterdam, 1924. Wenger, J. C. Pacifism and Biblical Nonresistance. Scottdale, PA: Herald Press. 1968. Yoder, Edward and Don. E. Smucker. The Christian and Conscription. Akron, PA: Mennonite Central Committee, 1945. Yoder, Edward. Compromise with War. Akron, PA: Mennonite Central Committee, 1944. Yoder, Edward. Must Christians Fight. Akron, PA : Mennonite Central Committee, 1943. Yoder, John Howard. The Original Revolution. Scottdale, PA: Herald Press, 1972. Yoder, John Howard. The Politics of Jesus. Grand Rapids: Eerdmans, 1972. Yoder, S. A. Middle-East Sojourn. Scottdale, PA: Mennonite Publishing House, 1951. Yoder, S. C. For Conscience Sake. Goshen, IN: Mennonite Historical Society, 1940. Hershberger, Guy F., Ernst Crous and John R. Burkholder. "Nonresistance." Global Anabaptist Mennonite Encyclopedia Online. 1989. Web. 25 Apr 2019. http://gameo.org/index.php?title=Nonresistance&oldid=162906. Hershberger, Guy F., Ernst Crous and John R. Burkholder. (1989). Nonresistance. Global Anabaptist Mennonite Encyclopedia Online. Retrieved 25 April 2019, from http://gameo.org/index.php?title=Nonresistance&oldid=162906. Adapted by permission of Herald Press, Harrisonburg, Virginia, from Mennonite Encyclopedia, Vol. 3, pp. 897-907; v. 4, p. 1147; v. 5, pp. 637-638. All rights reserved. This page was last modified on 31 December 2018, at 14:11.